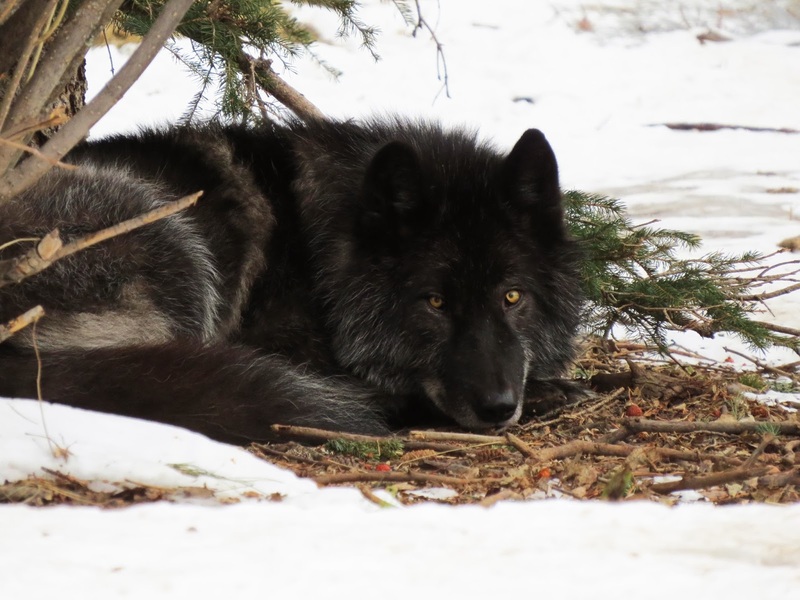 Catching an Edge: Four becomes Three - The Wolves of House Yamnuska! Four becomes Three - The Wolves of House Yamnuska! Yesterday Colin and I had a lazy one! We slept in after our last dance night and a few too many delicious grizzly shots! 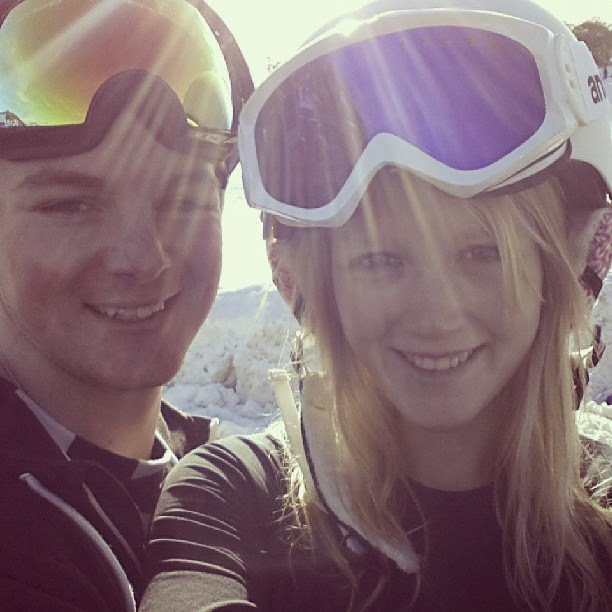 After a day of snowboarding and a night of dancing, we started planning the boring logistics of our home coming. It was good though, we also made lunch for Sarah and John just chatting and chilling! Which was so nice and soooooo yum! But yeah, it wasn't too adventurous unless you count heading up to the Chateau for ice skating on the lake. This was my second time iceskating ever! My first time was the week before, I have been umming and ahhhing at skating for weeks, renting skates, watching but never getting the courage to go out and skate! Finally Colin stayed in shoes and walked me around the Lake Louise Inn ice rink. It was so perfect! If you have never skated before, I recommend going around with a chair or someone holding you. By the end of that night I was going around by myself holding onto a hockey stick. Also a hockey stick helps a lot! But all in all, last night we skated for the first time on Lake Louise together! Absolutely AWESOME!! Today was so much more adventurous!! 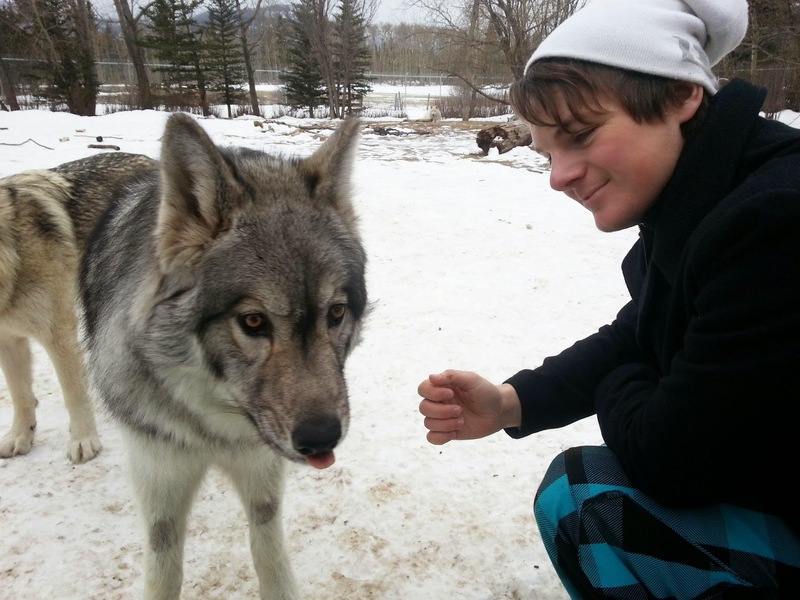 Colin and I organised to go to Yamnuska Wolfdog Sanctuary. We were recommended to go there from a few friends who have also left Lake Louise. It was an awesome recommendation! We booked our tour yesterday for 10:30am. So it gave us plenty of time to drive to Canmore, buy some things for our homecoming and then head out 20 minutes further down the highway. OH I couldn't believe I was seeing grass again, I haven't seen grass for months! We met with Georgina our tour guide and were lucky enough to be the only ones booked for the tour! 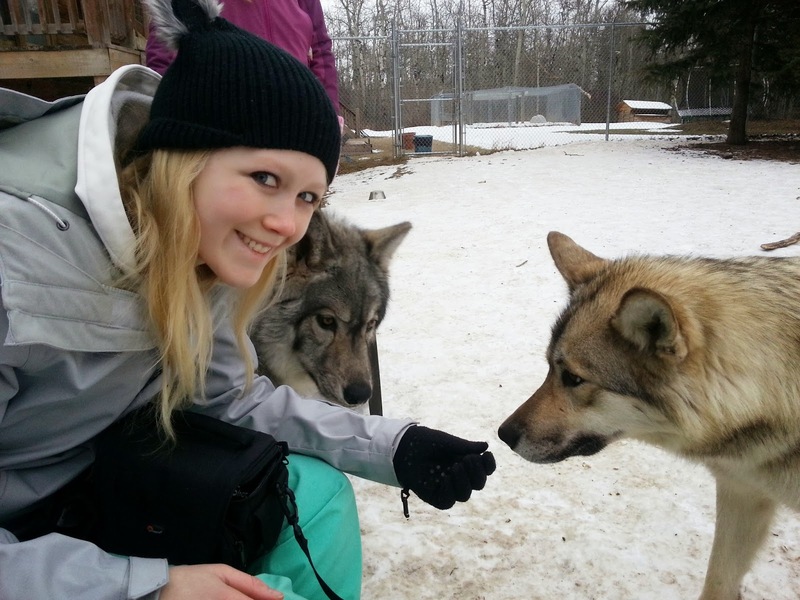 Georgina was such an inspirational person, she gave us a lot of information about the wolfdogs like how there is a massive misconception about wolves being aggressive. They aren't like the fairytales "big bad wolf", they are smart timid creatures that would run away from a human rather than attack. 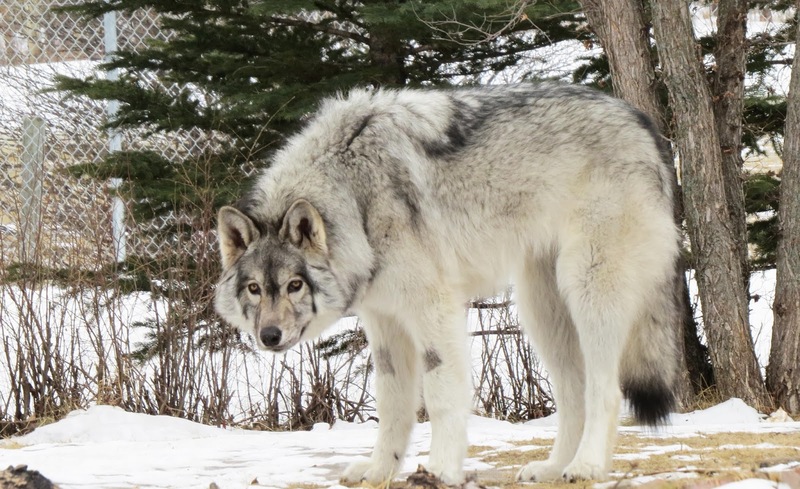 There are only maybe one wolf attack a year in Canada. They are very much like a Lynx, where they would hear humans and run and hide. It was very much the environment we were introduced to. Basically we were to walk into the sanctuary, walk straight to the chairs ready for us and to sit there. 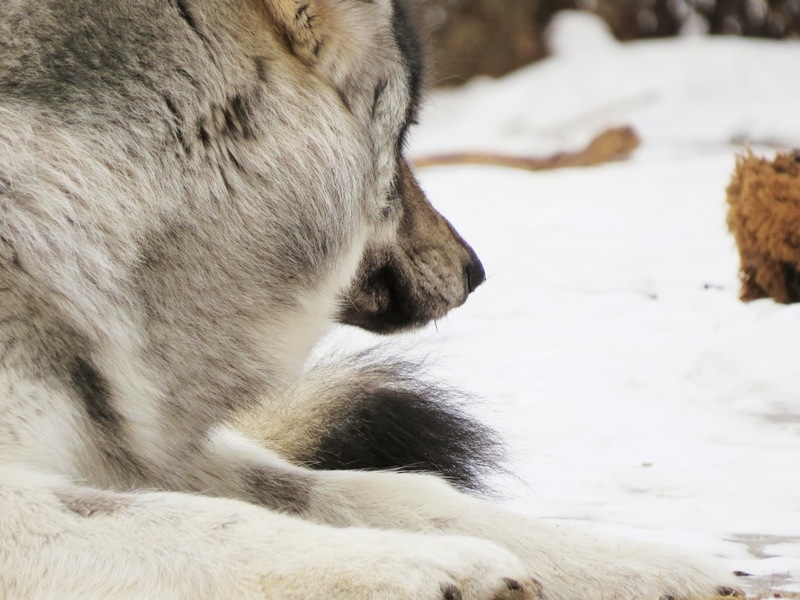 The wolves are use to people in the chairs, its something they have become accustomed to but if the chairs are moved or someone is standing, they become more timid and weary to the situation they are not use to. But they were not dangerous, just timid! There were five total. The first was Nikki, she's the baby of the pack and is a low content wolfdog, meaning she has less wolf in her. This means she's more easily domesticated and more friendly towards people. She was the first one up to us, didn't even wait until we were in the gate to run up and want cuddles from us. Kyra was the next gorgeous girl we met. She followed Nikki pretty quickly, and was giant and gorgeous!! She is a mid content wolfdog. Still so friendly but she takes a tiny bit longer to sniff you before letting you pat and cuddle her. She's a dog I would take home! They both knew some cool basic dog tricks and were very much a licking loving pair! 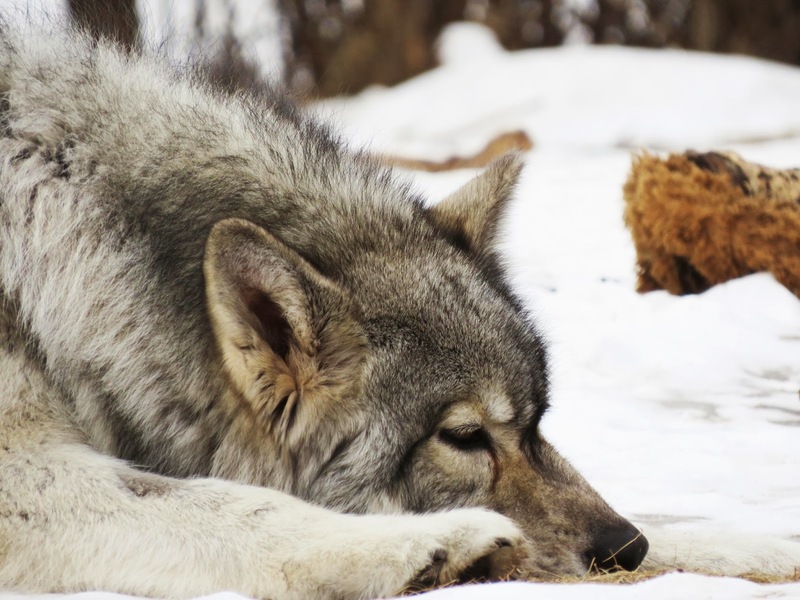 After they had their first sniffs and licks, they wandered to Kuna, the female high content wolfdog and their boss so she could suss is out a little before coming over. 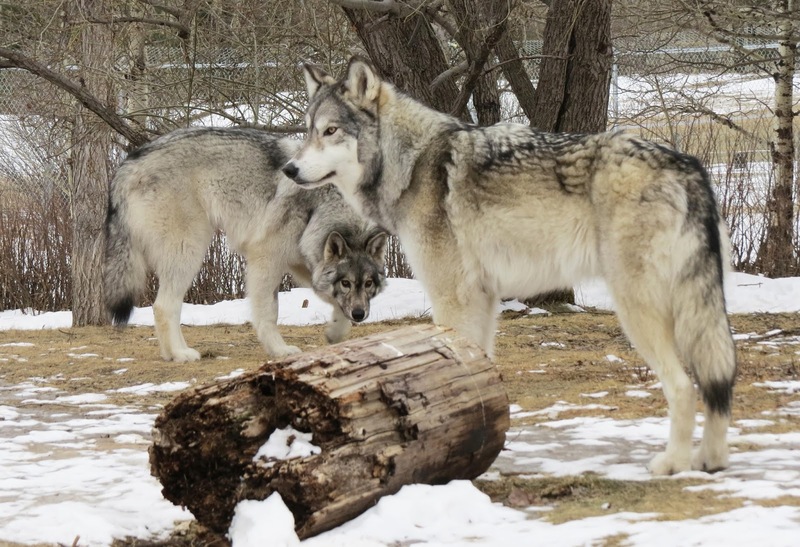 The three high content wolfdogs were Kuna, Zeus and Nova. Zeus and Nova being the only males. Their job is to make sure everything is safe but it's Kuna's job to keep the young girls in line. That's their wolf pack and they introduce more wolfdogs to the pack when they need to as well as other dogs. They are amazing animals! 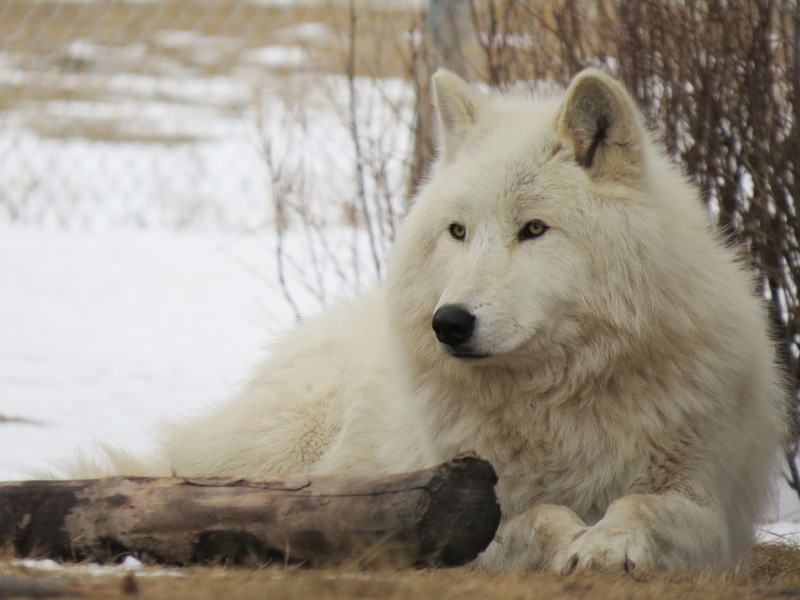 Another difference between the high content wolfdogs and the mid-low is that they don't have that dog instinct to try and impress humans. You can call them a bad dog and give them reward treats but much like cats they won't change their ways to impress you. But they are smart enough to know how to get treats, so if they feel like it, they will hand shake and pee outside to get treats but they don't care if they get yelled at. They are in control. Overall, we got to feed and pat the gorgeous animals, learn more about them and fall a bit in love with them! We took some photos but soon it was time to go before the weather went sour. I am so very happy we were able to have this experience! 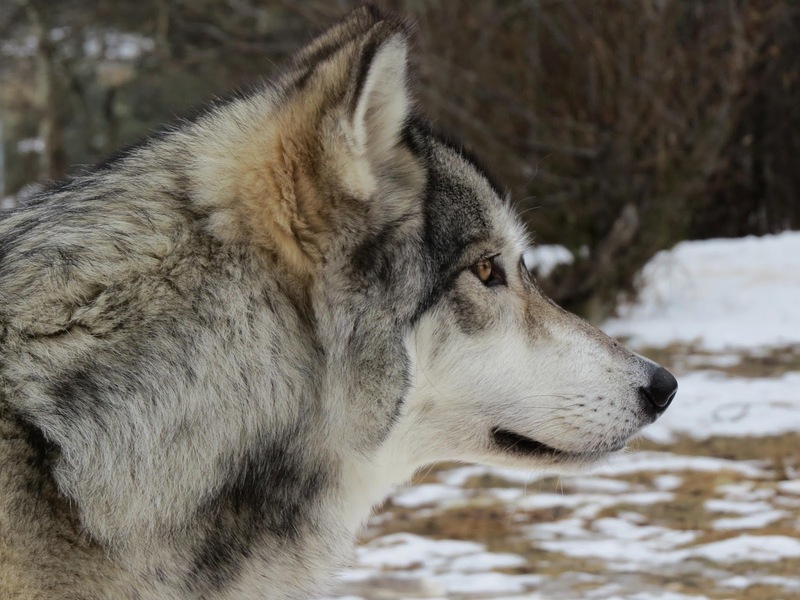 The wolfdogs were so stunning! I loved every moment of the tour!! I highly recommend going, its about $40 per person for an hour and the proceeds go towards looking after the wolves. Loved every second! Thank you Georgina!! Check these guys out on their Facebook! !